Everyone has been told that fish oil, commonly called omega-3, is good for your health. This has now been proven wrong. Fish oil consists only of an inferior and potentially harmful form of omega-3s called “derivatives.” Omega-3 derivatives are NOT essential EFAs. There are only two true essentials humans must consume from food or supplements every day—“parent” omega-6 and “parent” omega-3. Your body cannot manufacture them. 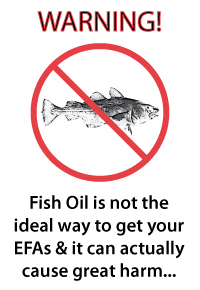 Be aware these parent EFAs are not found in fish oil! Your body only needs a very small amount of those derivatives, and it makes those out of parent EFAs as needed. Just 1%-5% of the parent EFAs turn into derivatives; 95% STAY in parent form. Overloading on omega-3 derivatives from fish oil can be extremely harmful to health (causing severe physiologic overdose). Preliminary research often overlooked these critical facts, but landmark new research in 2009 and 2008 enlightened the medical community. Real-life clinical results prove that patients show marked improvements when they change their daily EFA supplementation from fish oil (omega-3 derivatives) to a much more complete and biochemically correct blend of PARENT ESSENTIAL OILS (PEOs). PEOs are plant-based, cold-pressed, organically grown seed oils derived from flax, pumpkin, sunflower, and evening primrose. Based on the latest, most comprehensive new science in 2009-2008, it is clear that a proper combination of parent omega-6 and parent omega-3 is so far superior to fish oil and other EFA supplements, that it completely replaces everything else. • Greater parent omega-3 = fewer heart attacks. • Fish consumption didn’t stop heart attacks. 1. March 30, 2009, Bloomberg News, Orlando, Florida Cardiology Convention. 2. Heartwire 2009, © 2009 Medscape, January 28, 2009 (Dallas, Texas), based on Journal of the American Heart Association, Ref. : AHA Science Advisory, Harris WS, Mozaffarian D, et al., “Omega-6 Fatty Acids and Risk for Cardiovascular Disease: A Science Advisory From the American Heart Association Nutrition Subcommittee of the Council on Nutrition, Physical Activity, and Metabolism; Council on Cardiovascular Nursing; and Council on Epidemiology and Prevention”; Circulation, February 17, 2009; 119(6): 902 - 907; and American Academy of Anti-Aging Medicine referenced February 2, 2009 at http://www.worldhealth. 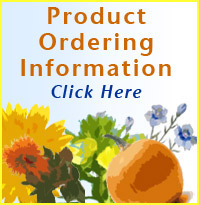 net/news/concern_about_omega-6_fatty_acids_leadin. 3. Hannia Campos, PhD; Ana Baylin, MD, Dsc; Walter C. Willett, MD, Dr Ph, Circulation, 2008; 118:339-345. 4. American Journal of Clinical Nutrition, Vol. 88, No. 3, 801-809, September 2008 and Hussein, Nahed, et al., “Long-chain conversion of linoleic acid and alpha-linolenic acid in response to marked changes in their dietary intake in men,” Journal of Lipid Research, Volume 46, 2005, pages 269-280. 5. 2008 meeting of the Society for Nuclear Medicine—Advancing Molecular Imaging and Therapy (reported New York (Reuters Health) June 23, 2008).